Latex paint in accordance with German regulation concerning hygiene in the food sector. Silk-matt, wet scrub-resistance class 1, corresponding to scrub-resistant as per DIN 53 778. Easily to clean. 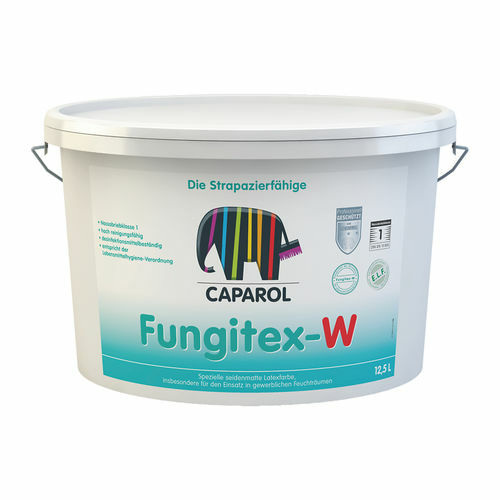 Fungitex-W is a special latex paint with a preservative against deterioration in the coating film due to fungal and bactericidal attack. Particularly suitable for coating interior surfaces of industrially used damp locations, e.g. in breweries, slaughterhouses, creameries, hospitals, sanitation spheres and also suitable for living spaces. Fungitex-W is highly durable (wet scrub resistance class 1) and hence suitable for the application on surfaces that need to be cleaned or treated with aqueous disinfectants. Due to these properties the product complies with German food hygiene regulation. Fungitex-W is tested according to the guidelines of AgBB (German commission for the sanitary evaluation of building materials) regarding the suitability for use in the interiors, even more than fulfilling the strict standards for volatile organic components. Hence the safe applicability for interiors is being confirmed. Highly cleanable and resistant to aqueous disinfectants. Complies with the requirements of German "Lebensmittelhygieneverordnung" (food hygiene regulation).